Pledging my 25th birthday to help Sakina Khatun fulfill her dream of winning the gold for India at the Paralympics 2016. Please join in to support! Feel free to reach out to me: dmonte.alister@gmail.com if you have any questions or queries on this Birthday fundraiser of mine. As I turn 25 this year, I'd love to help India's premier athlete Sakina Khatun and help her to represent India at the paralympics in Rio 2016. The biggest dream of any athlete is to represent their country at the highest level. All athletes, irrespective of their physical attributes, deserve equal opportunities to train and compete. 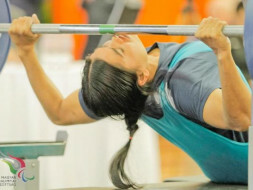 Sakina however aspires to lift over 95kg at the 2016 Paralympics and aims to claim the gold medal inthat competition. According to her coach Farman Basha, she already lifts a weight of 95kg+ during everyday training, but requires more exposure to high performance international training, with thebest equipment and facilities, and international tournaments, to produce similar results incompetitions. The amount raised on my birthday campaign here will go to the GoSports Foundation, a not-for-profit venture working towards the development of some of India's most talented junior athletes across Olympic and Paralympic disciplines since 2008. GoSports Foundation intends to send Sakina to Nigeria, for 1 month high performance training followed by an international competition to help her fulfill her dream of winning a gold medal forthe country at the 2016 Paralympics in Rio. You will get an update on how the funds were utilized - will ensure you get a clear update on how Sakina is doing an how the funds have been used to help her! You can contribute as little as Rs. 250 or $25 to help me reach my goal of Rs. 2,50,000/- If you cannot contribute for whatsoever reason, please share it on Facebook or Twitter. All the best...go for GOLD! Happy Birthday Alister. Smile on!